PICTURED: Judy Ryan, a retired teacher and facilitator of one of the writing groups, reads a piece by a participant, as other writers look on. 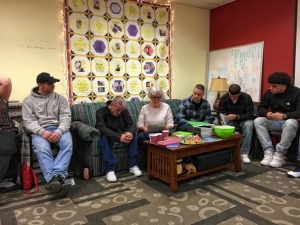 She said she “got to know a group of seven courageous men who shared their experiences honestly and openly.”About 30 people took part in writing groups about how the opioid crisis has impacted their lives. The experience culminated in a reading and reception at the Northampton Recovery Center last month.